High Court For The State Of Telangana, Hyderabad, Is Appointing Eligible 67 People To The Post Of Civil Judge (Direct Recruitment). So Interested Indians Can Apply For This Job Through Online Application Mode, Within The Given Time Period Mention Below. Kindly Do Read Out The Official Advertisement For An Accurate Information And Instructions, It's Provided Down Below. A. Number Of Vacancies And Name Of The Posts. Civil Judge →67 Vacancies, Kindly Go Through The Image Below For Vacancies Distribution And More. B. 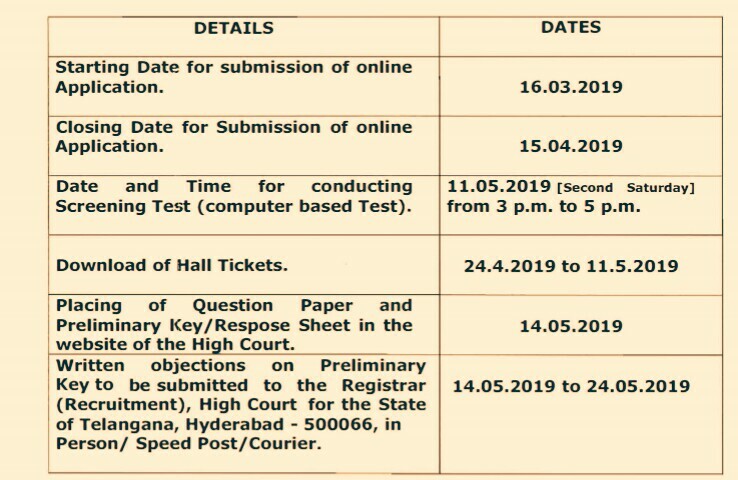 Eligible Criteria For Civil Judge Direct Recruitment In Telangana High Court 2019. Age Limit →An applicant applying under Direct Recruitment shall be a person who has not completed the age of 35 years as on first day of the month in which the notification inviting applications for such appointment is published in the news papers i.e. 01-03-2019. Educational Qualifications →Only those candidates who possess the qualifications prescribed under Telangana State Judicial (Service & Cadre) Rules 2017 which are mentioned below, shall be eligible to apply. Mode Of Examination/Selection Process →Computer Based Exam/Viva Voce. Online Application/Examination Fee →The applicants who belong to OC/BC categories have to pay an amount of Rs.500/- (Rupees Five hundred only) towards Online Application processing fee/Examination fee, whereas the applicants belonging to SC/ST categories have to pay Rs.250/- (Rupees Two hundred and fifty only) towards Online Application processing fee/Examination fee. Applicants belonging to SCs/STs, hailing from other than the State of Telangana have to pay Rs.500/- instead of Rs.250/- towards Online Application processing fee/Examination fee, unless the caste to which they belong, is recognized as Scheduled Caste or Scheduled Tribe, as the case may be, by the Government of Telangana. Last Date For Online Application Form Submission →15th Of April, 2019. Admit Card/Hall Ticket Download →Check Out The Image Below For Important Date, For Hall Ticket Download, Exam Dates And More. For More Info →The Official Website Of High Court Of Telangana, Hyderabad. Now Apply For Civil Judge Job Vacancy In Telangana High Court Recruitment Notification 2019.